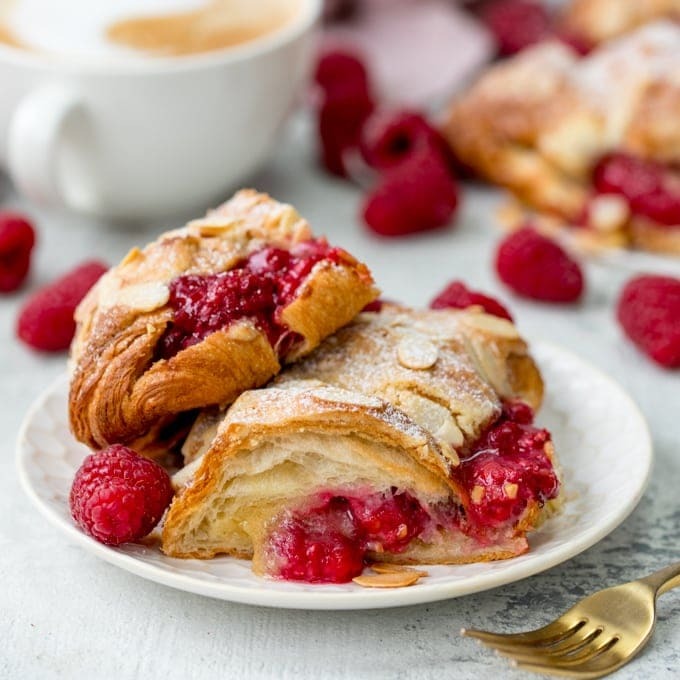 It’s Mother’s day in the UK on Sunday, how about serving this up as an indulgent breakfast treat? Following my discovery that I don’t like sourdough bread, I’ve been looking for ways to use up the sourdough starter I have left over. My scones were a success, next in line were pancakes! I had some bananas that were past their best, so I thought I’d kill two birds with one stone and use those up too. 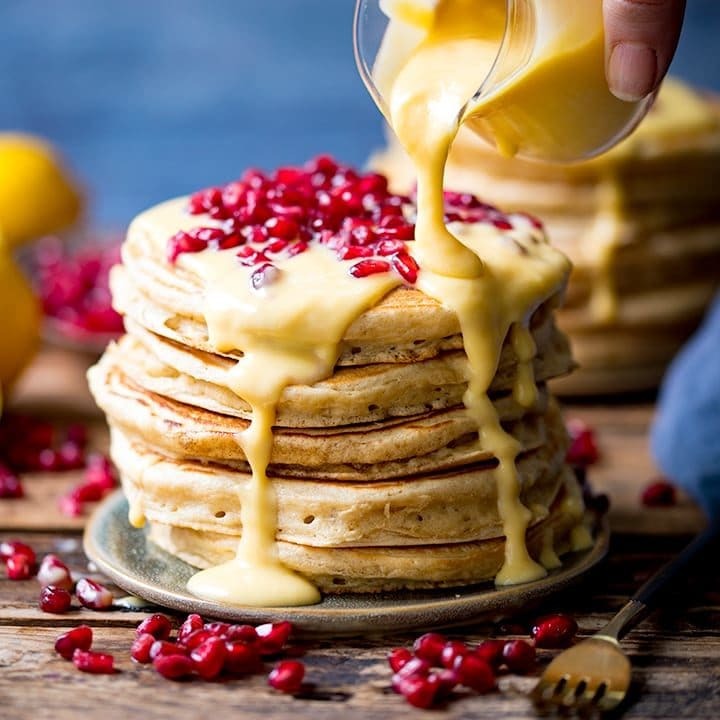 The resulting pancakes were fluffy and light, plus the two bananas in this recipe makes it at least a tiny bit healthy……. The salted caramel sauce is surprisingly quick and easy to whip up (I’m trying not to use this an excuse to pour on everything now) and the hint of salt lifts the sauce just enough so that your mouth doesn’t feel like it’s drowning in a pool of sticky, sweet devilishness. I got the recipe for the caramel sauce from www.nigella.com. 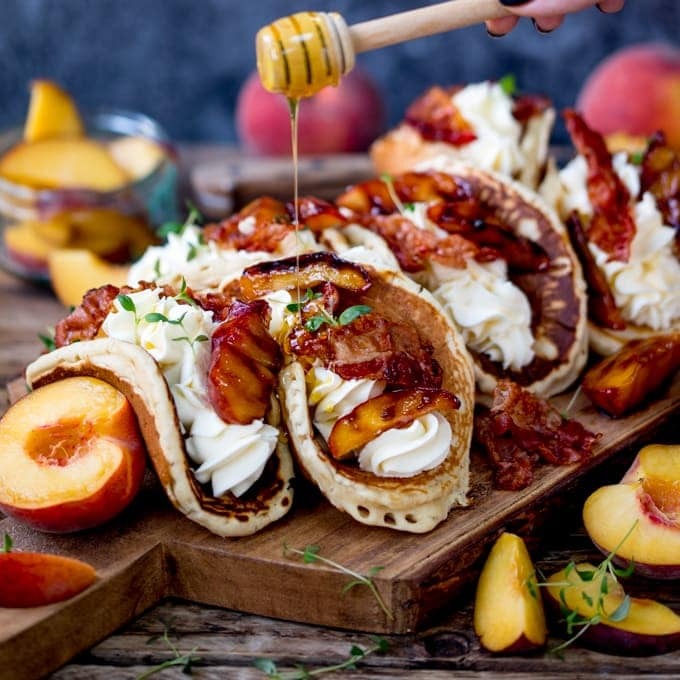 Of course, you don’t have to use sourdough starter to make these. If you’re not using the sourdough starter, then it’s simply a case of using a bit more milk and flour and a bit less baking powder. The recipe below covers both versions (and the non-sourdough ones taste just as good). Make the salted caramel sauce first by adding the butter, sugars and syrup to a pan. Bring to a gentle bubble and simmer for 3 mins, swirling the pan every minute or so (it will probably look a bit ‘bitty’ but that will go away when you add the cream). Pour in the cream and stir – you should see it coming together as a smooth sauce now. Then sprinkle in most of the salt. Carefully have a taste and add more salt if needed. Turn the heat off. You can heat though again for a minute once the pancakes are ready. Pancakes next: In a large bowl place the Sourdough starter (if using), flour, sugar, baking powder, vanilla extract, salt and the egg. Start to mix slowly with a balloon whisk or fork whilst slowly adding in the milk. Once all the milk is added, drop in the mashed bananas and give it a quick stir. 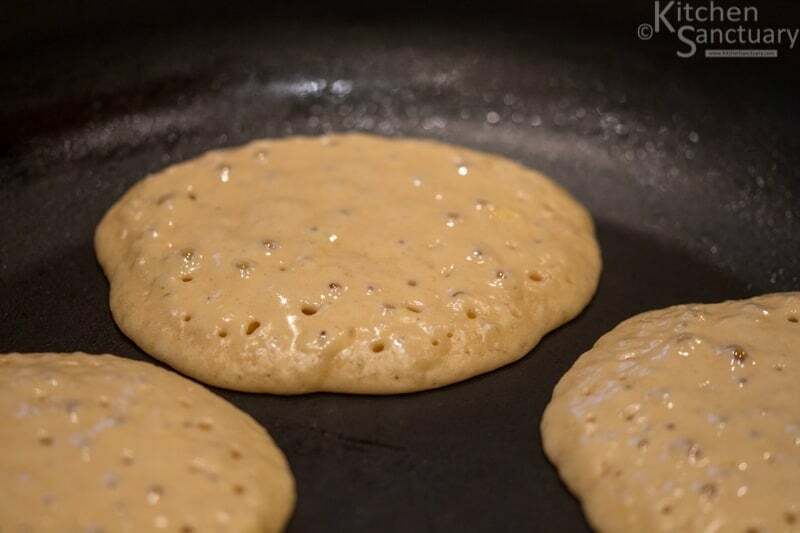 You should end up with quite a thick pancake batter. Don’t overmix, it’s fine if it’s a bit lumpy. 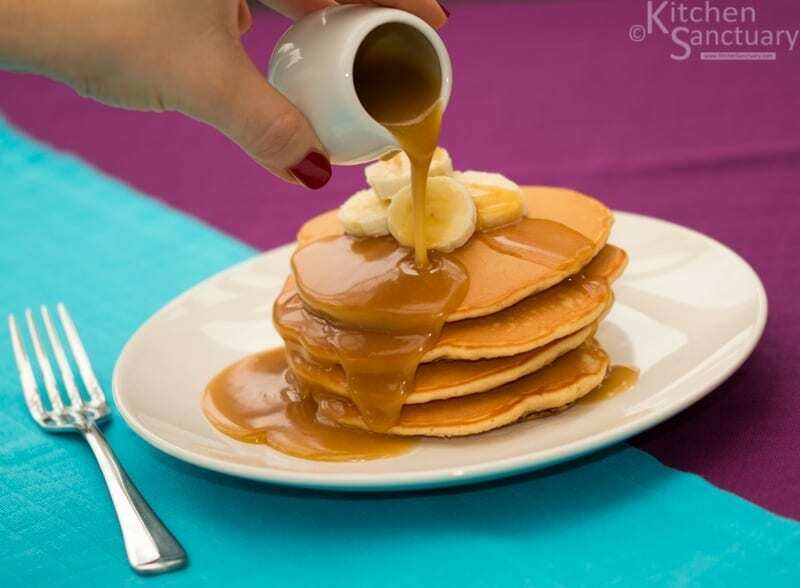 Serve the pancakes in stacks of 3 or 4 with a few slices of banana on top, then drizzle with the salted caramel sauce. Tip In the unlikely event that you have any mixture leftover, make the pancakes anyway, and freeze them (with a bit of greaseproof paper or baking parchment in between to stop them sticking together). 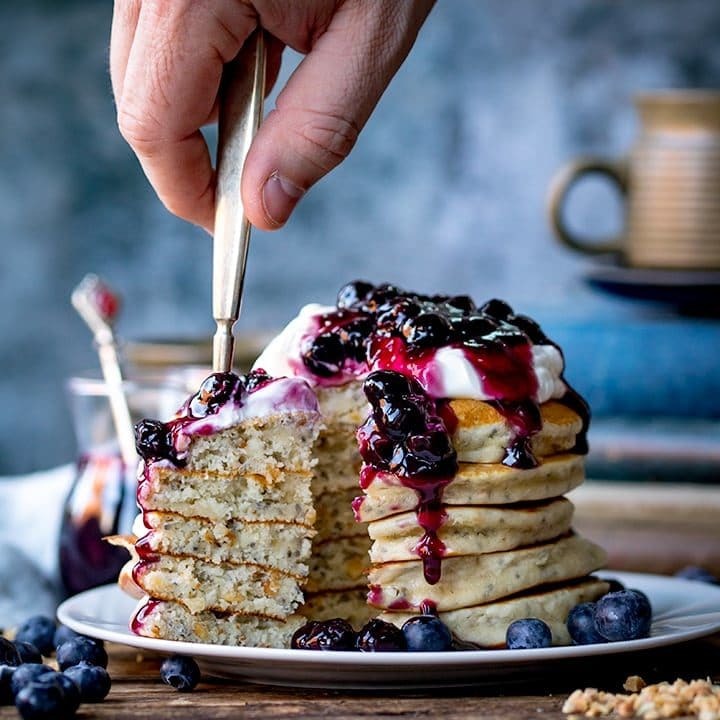 The pancakes can then be partially defrosted (5 or 10 minutes out of the freezer should do it), reheated in the toaster and spread with a bit of butter.